BEDFORD, Mass., Jan. 3, 2011 â€“ iRobot Corp. (NASDAQ: IRBT), a leader in delivering robotic technology-based solutions, today announced two new home robots to do your dirty work: the iRobot ScoobaÂ® 230 â€“ a floor washing robot small enough to clean in tight spaces and around bathroom fixtures â€“ and the iRobot RoombaÂ® 700 Series, the smartest and most effective Roomba vacuum cleaning robots to date. Both will be unveiled at the Consumer Electronics Show in Las Vegas on January 6.
iRobot Scooba 230 and iRobot Roomba 700 Series use iAdaptâ„¢ Responsive Cleaning Technology, the most intuitive, flexible and effective way to clean your floors. This system of software and sensors monitors the environment 64 times per second, using dozens of behaviors to ensure the entire floor is thoroughly cleaned. The dirt-centric technology ensures thorough coverage, including under and around furniture, and multiple passes over the areas that need it most. Scooba 230 is a powerful and compact cleaning machine. 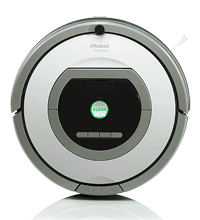 At 3.5 inches tall and 6.5 inches in diameter, the robot easily cleans in tight spaces, including under and around furniture and bathroom fixtures. The robotâ€™s three-stage cleaning system washes, scrubs and squeegees floors, neutralizing up to 97 percent of common household bacteria*. Scooba 230 holds enough cleaning solution to scrub up to 150 square feet of linoleum, tile or sealed hardwood floors in a single cleaning session. Unlike with a mop and bucket, Scooba only uses clean solution to wash your floors, never dirty water. Scooba 230â€™s water management system includes an active reservoir that keeps the cleaning solution and dirty water separate inside the robot. While the robot is cleaning, the active reservoir shrinks in size as cleaning solution is put down on the floor, freeing up space in the robot to hold the dirty water that is picked up. Scooba doesnâ€™t move dirt (or dirty water) around â€“ it gets rid of it. Scooba uses a series of lights and chimes to let you know it has successfully finished cleaning. The bottom plate of the robot snaps on and off without tools, making it fast and easy to rinse the scrubbing brushes and the squeegee after each use. Virtual WallÂ® technology creates an invisible beam that the robot wonâ€™t cross, keeping Scooba 230 in the rooms you want to clean and out of the ones you donâ€™t. Cliff sensors ensure the robot automatically avoids stairs and drop-offs while cleaning. â€¢ Advanced cleaning head improves overall cleaning from previous models, including 20 percent better pickup of fine particulates. â€¢ New AeroVacâ„¢ Series 2 bin with a powerful vacuum maximizes air flow through Roomba’s cleaning head to pull more hair and debris off the brushes and into the bin. â€¢ Two HEPA-type air filters keep fine household dust from re-circulating in your home. â€¢ Dirt Detect Series 2 (available on Roomba 770 and 780) uses an acoustic sensor to detect excessive amounts of small and hard debris, such as sand, and an optical sensor to detect larger and soft debris, such as popcorn. Dirt Detect Series 1, which uses the acoustic sensor, is available on the Roomba 760.
â€¢ With a Persistent Pass Cleaning Pattern, Roomba uses a brush-like, back-and-forth motion to focus its cleaning when it finds an excessively dirty area. â€¢ New power management software results in 50 percent longer battery life than previous Roomba generations, ensuring hundreds of cleaning cycles with proper use. â€¢ Soft-touch bumper with a new polymer coating protects walls and furniture. â€¢ Full Bin Indicator light turns on when Roomba detects a full dust bin (available on Roomba 770 and 780). â€¢ Touchpad interface provides state-of-the-art control using just your fingertips and eliminates buttons (available on Roomba 780). Scooba 230 plus Essentials Kit and Roomba 700 Series will be available in spring 2011 at www.irobot.com.